There are days when it seems you plan an agenda down to the minute. Cam was scheduled for two Grand Valley sessions as well as an extracurricular visit to Mary Free Bed. After morning chores and studies, Amanda and Cam headed to GV meeting #1. It was a very productive session with the PT students, possibly influenced by the fact that one of the grad physical therapists was named Cameron too. Next up was a trek to Mary Free Bed. Jane met Amanda and Cam there with a picnic lunch. A group of recent graduated high school students who expressed an interest in health care were spending the day touring Mary Free Bed. One of Cam's PT buddies, Ms. Andrea, asked Cam if he and his mom would talk to the students about their therapy experience. We entered a room where all of the kids were gathered and Cam asked them each to introduce themselves, which they all did. It was a fun half hour as Jane and Cam asked questions and answered inquires. Immediately following the MFB time, Amanda and Cam headed back to Grand Valley. One evening, Amanda's Aunt Carol and Uncle Jim invited our family to swim in their saltwater pool. Amanda's grandpa, Ken (aka Papa) was there too. For Cam, it truly was an awesome experience because of the water floats Aunt Carol had. Not only was he relaxed, but he felt secure and safe too in the buoyant toy. None of us had been in a saltwater pool and we all decided it was far better than the typical chlorine variety. Cam was most impressed that Aunt Carol could control the underwater pool lights with an app on her phone! The weekend brought Auntie Karen in from Chicago to visit and spend time with our family. Cam was excited to learn a new dice game called LCR (Left, Center, Right) that Karen taught us to play. At one point, we lost one of the die and after searching for quite a few minutes, Jane asked Cam to back his chair up. He began laughing and said, "can you hold this a minute?" Turns out, the mischievous kiddo was holding one of the dice in his hand. We brought Auntie Karen to the cottage on Sunday and although it was a rainy morning, the afternoon skies opened up to glorious sunshine. A long walk on the beach produced a rarely seen crayfish on the Lake Michigan shoreline. Cam enjoyed a kayak ride with his mom and expert paddler, Auntie Karen. As they were coming in after a leisurely excursion, some afternoon boaters produced some rolling waves that sideswiped the kayakers with a rogue wave. The afternoon beach activities came to an end late in the day. The fun continued with a barbecue chicken dinner feast out on the picnic table. Oma's homemade apple pie topped with delicious vanilla ice cream finished out our meal. The events of the week left us feeling blessed and thankful for those who continue to give of themselves and their time- as we know, the most precious gift of all are memories made with those we love. "Wow, it smells like a cow farm in here!" The first part of the week was dedicated to animals. Miss Amanda was pet sitting again and Cam had a chance to visit his favorite guinea pig, Priscilla Pigsley. 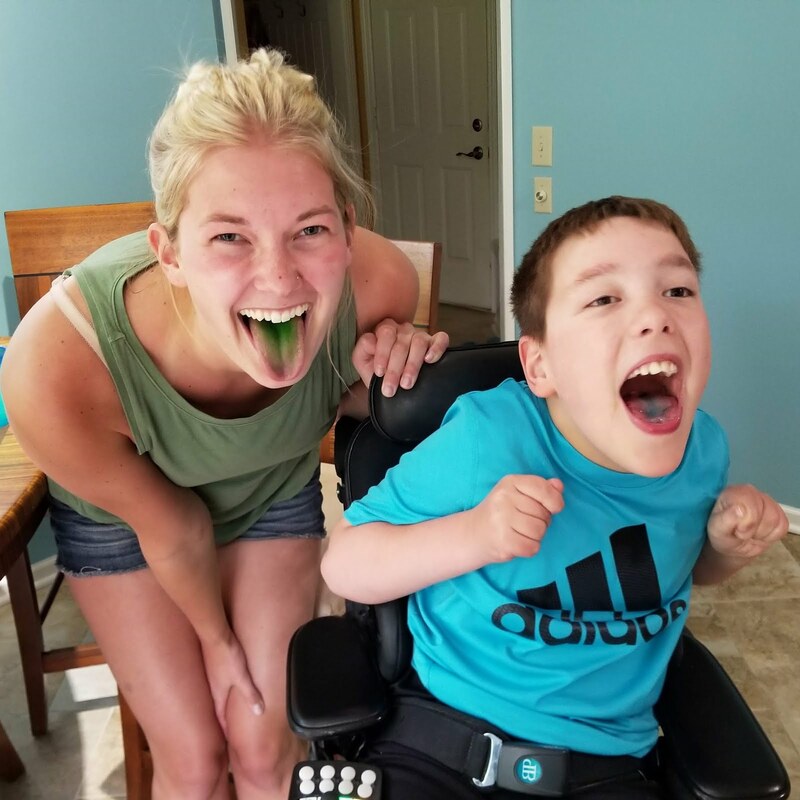 Jane had to travel overnight to St. Louis for work, but Amanda kept Cameron plenty busy. At our local library, they offer a different event for kids each week in the summertime. Farm-on-the-Go was the chosen experience on Tuesday where a variety of farm critters took over the library lawn. 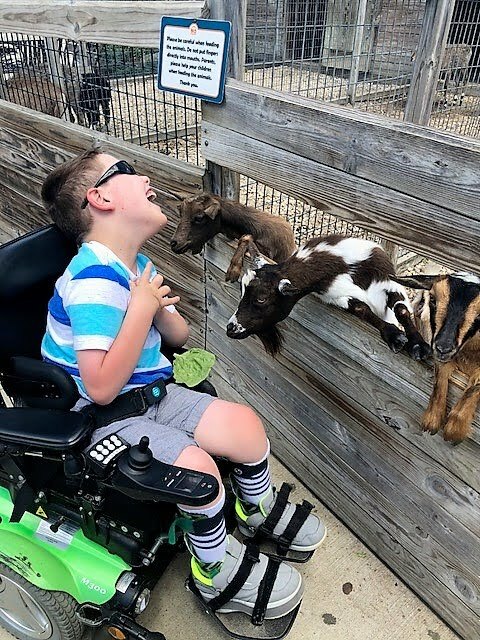 Cam pet a rooster, a bunny, and a goat. 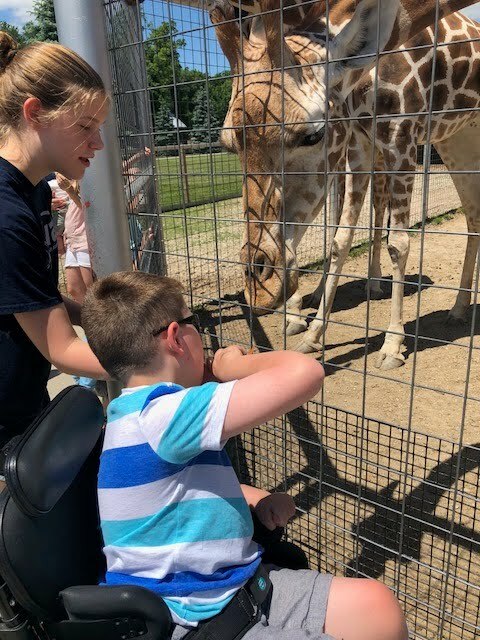 Next up, was the first trip of 2018 to visit Boulder Ridge Wild Animal Park (website). Amanda, Cam and Emma headed out to the unique zoo to spend the morning feeding the animals and riding the tram. Watching the giraffes bend their long necks all the way down to kid level is always a surprise to Cam. And the pigmy goats looked like they would try to gobble up our ten-year-old if he got close enough. 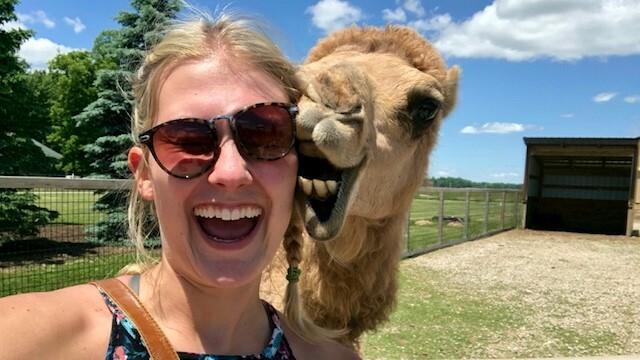 Perhaps the funniest pic of the day was the camel smiling for a selfie next to Miss Amanda! Friday's adventure was a reserved afternoon time slot at Reeds Lake for the Sailing Clinic with Mary Free Bed. We were surprised to see Cam's "Halloween 4 the Rest of Us" buddy, Miss April. She had signed up for sailing as well. These two met a couple of years ago and have hung out at many different events. It was a surprisingly calm afternoon and our first course of action was to take a pontoon ride around the lake. The relaxing ride lasted about 30 minutes and then it was time for our sail. Captain Mary took Cam, Amanda, Jane and two other passengers on our voyage. Due to lack of strong winds, though, our venture was short but fun. A paddle was used to bring us partway back to shore. One may think this may be enough for one week, but we weren't done yet! Saturday was the walk for Lori's Voice, an organization geared specifically to help children with special needs. Lori's Voice is a 501(c)(3) non-profit organization which was founded and established to help young people with disabilities. 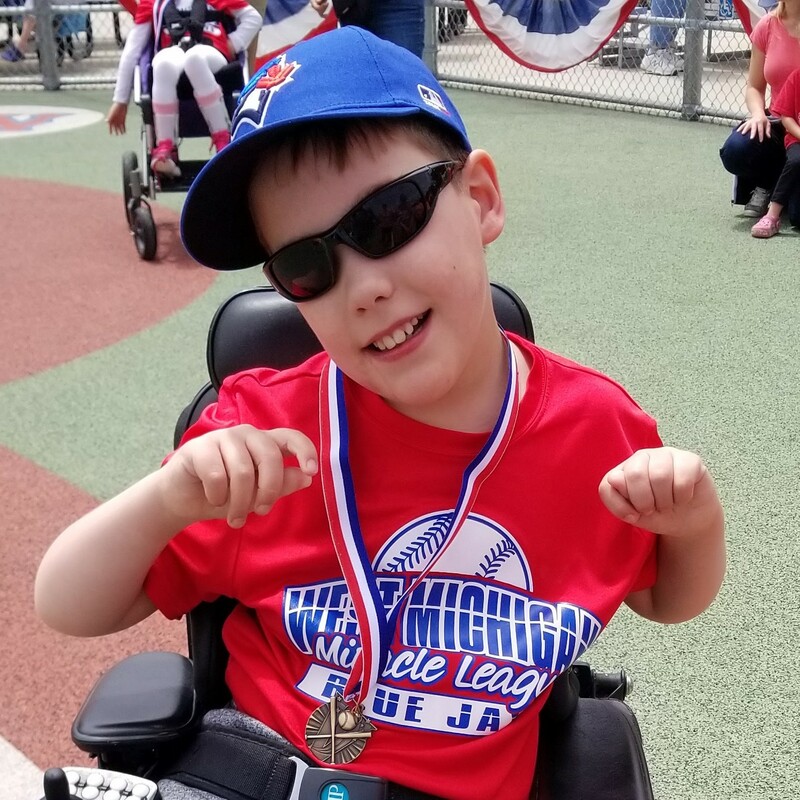 This organization evolved from Lori Hastings' great love for children and the realization of so many challenges young people face when living with a disability. Living with a disability herself, Lori understands the medical needs that are not covered by insurance. 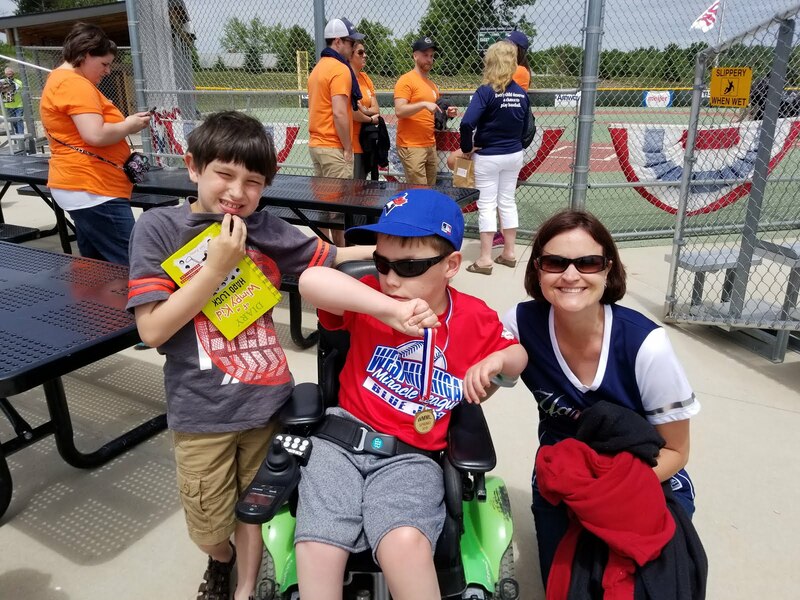 Lori's Voice takes great pride in the fact the the entire organization along with our fundraising activities is completely handled by volunteers. No one at the organization takes a salary. The best part of the morning was seeing how many people came out to support the event even in the pouring rain! 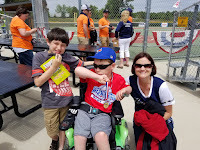 We met Lori and Dave Hastings years ago at the West Michigan Miracle League. They attend nearly every game just to lend their support and pass out blankets when it's chilly. The annual "Walk for the Challenge" at the Berlin Raceway in Marne, Michigan was underway with inclement weather. The track is almost half a mile long and paved which makes it perfect for power chairs, wheelchairs, strollers, etc. The money raised goes toward Lori's Voice and its mission. Local news was also in attendance to cover the story. One of the volunteers gave Cam a blue cape made for all of the kids by a supporter of the charity. And, our son/hero met some other "superheroes" while we were there! Ms. Lori is definitely a superhero to Cam! From rainy day to sunshine and warm breezes, we drove north on Sunday. While Grand Rapids peaked in the high 90's that day, Lake Michigan kept us out of the red as we enjoyed Father's Day on the big lake. The waves were rolling and Chris had a good workout paddling us south just to keep up with the current. We shared a delicious dinner with Oma and Opa, thankful to be able to eat outside on the handmade picnic table built by Chris and his son. On Father's Day and every day, we truly appreciate all of the many talents and gifts Cam's dad possesses, but mostly, we are just simply grateful for the gift of him. "If it's important they should answer the call." It was hard to believe the last week of school was upon us. Oma came to stay with us for a few days while Chris traveled to Ohio for work. Jane and her mom picked out some beautiful flowers to plant in the mailbox area as well as the big planters. Even after a full day of school, Cam was ready to help put the flowers in their place. To help keep the dirt off of Cam's power chair, Jane had pushed the arm backwards. After the planting was completed, Oma and Jane gathered the materials and started up the driveway...Cam could not stop laughing and when asked why he was giggling, he had a tough time talking until finally his mom realized why. Turns out she had not brought the arm of his chair into drive-able mode, so he literally couldn't move. It was quite some time before the hilariousness of the situation wore off. The next few evenings were full of grandma/grandson activities including the Passport monthly gift from Auntie Karen. Oma left on Wednesday and we were sad to see her go, but we knew a trip to the cottage was on our agenda for Saturday. 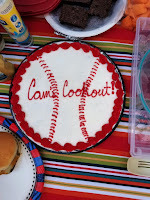 Thursday was a half day for Cam and the day of our annual school cookout! Everyone arrived at 1pm to celebrate with teachers, therapists, aides and classmates. Each tasty treat brought by the attendees was enjoyed and the huge decorated cookie brought by Ms. Cris and Mary Jo was really cool! The afternoon went by much too quickly and the theme of the day was "see you later" vs. "goodbye." Although we neglected to capture a group picture, it further solidifies the fact that we will continue to see our friends. 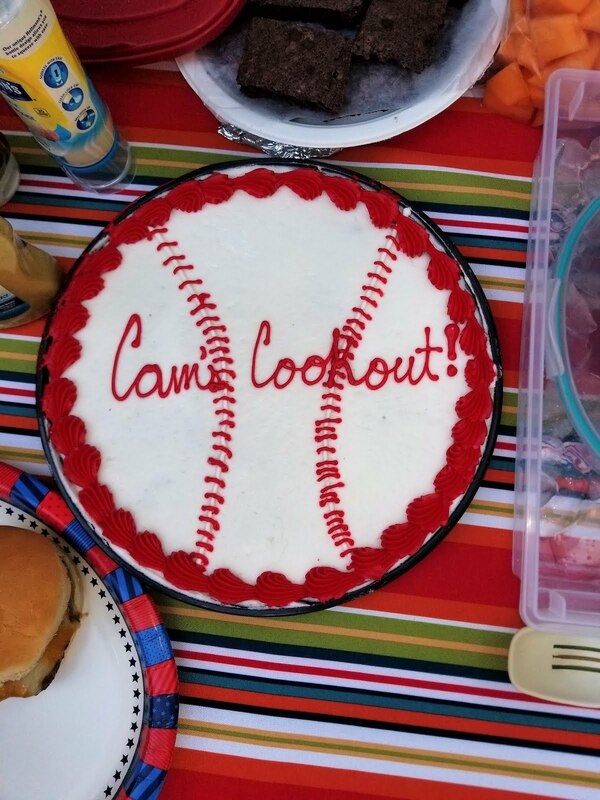 Cam had already indicated that his Meadow Brook family would be at his house for the cookout every year and we will "add in" the Northern Trails group. Friday marked the final day of our 4th grader's school year. 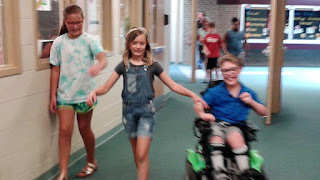 Since this was the last time the current 4th grade students would be at Meadow Brook, it is tradition that the classmates parade through the school. Cam's teacher sent the pics to us and said that our son was all smiles. Thx Oma for the delicious Ryke's cake! On Saturday, we headed up north to celebrate Jane's 49th birthday. Thankfully, Auntie Jo brought plenty of homemade games and activities for Cam to play due to the dreary weather. Although the weather didn't cooperate, time with family and friends brought the sunshine inside. Oma, Opa, Auntie Jo, Aunt Joyce and Uncle Joe, Annie and Aunt Gay all shared cake and ice cream together with us. Hanging out and relaxing certainly is a great way to enjoy a birthday. Jane did say her favorite moment was hearing her son sing, "Happy Birthday to mom!"